356 Porsches from the A's to the C's came from the factory with a toolkit. Over the years, the toolkit and its contents have changed. This website will attempt to present some facts about Porsche 356 toolkits and the changes that were made from time to time. As with everything 356, there are no certainties and lots of exceptions! The information and pictures presented here come from 356 Porsche factory owners manuals. A total of 23 Porsche 356 owners manuals, including various versions and edition dates, were reviewed to compile this information. For 356-A to 356-C Porsches, there are essentially three different factory toolkits. Some of the owners manuals for 356-A's to 356-C's from which toolkit information was taken. Click here for DerWhite's 356 Porsche Sales & Technical Literature Website! Major DIfferences in 356 Toolkits! 1. The type and number of screwdrivers (3 v. 2, wood handled v. plastic). 2. The type of open end wrenches (all have 4). 3. Two different wheel nut wrenches. 4. Black v. plated pliers and black v. plated generator pulley nut wrench. 5. The existance and type of air pressure gauge. 6. The existence of a hubcap puller. 7. The style and color of the tool bag. See the Carrera Toolkits below. The following table lists the various Porsche 356 owners manuals that were consulted in this analysis. For each owners manual, there is listed the model (356 ABC), the printing number, the printing date, the language version, and which toolkit shown below is shown in each owners manual. You will note that toolkit #3 appears only one time. The only difference between toolkit #2 and toolkit #3 is the inclusion of a spark plug in the photo. Scroll down for photos of each tool kit along with a listing of all the tools included in the kit. These photos were scanned directly from the owners manuals. The tool kits marked with an (*) do not list the open end wrench sizes. This analysis is not intended to be the last word on toolkits, rather it is a factual listing of information taken from the factory owners manuals. Of course, there are always exceptions! Toolkit #1 is for the Pre-A Porsches and is not shown. From the September 1957 356-A Owner's Manual. From the May 1960 356-B Owner's Manual. Both Owner's Manuals above showed the same Toolkit! Toolkit #2 was found in 356-A's and 356-B T-5's. 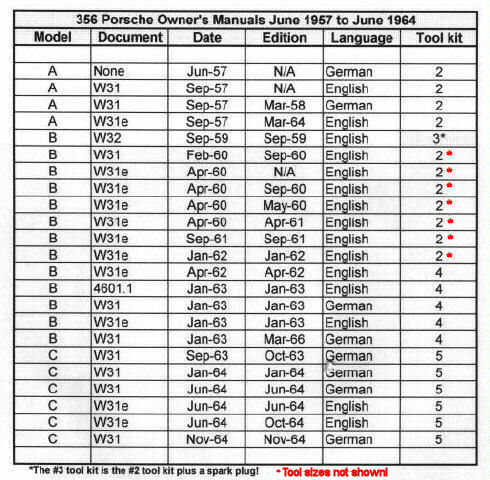 In the 356-A Owner's Manuals, the open end wrench sizes are listed. They are not listed in the 356-B T-5 owner's manuals. The change to toolkit #4 seems to occur sometime around April 1962, at or near the time the 356-B T-6 was introduced. For this toolkit, the tools fit in the slots, the top flap folds down, and the toolkit is rolled left to right and fastened together with a leather strap and buckle. In the picture above, you can see the buckle on the right edge of the toolkit bag. There are 3 wood handled screwdrivers, black painted pliers and pulley nut wrench, and what appears to be a chrome plated tire pressure gauge. Tool kit #3 above is exactly the same as toolkit #2, except for the addition of a spark plug in the photo. 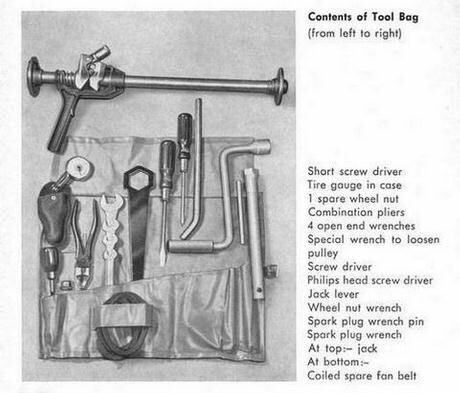 Why spark plug was added only to this toolkit (or this photo) is unknown. 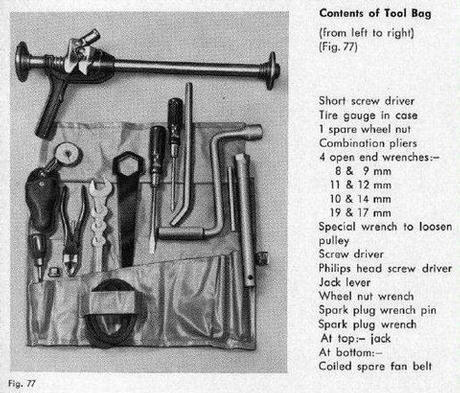 Toolkit #4 first appears in the April 1962 owners manual and is quite different. This timing suggests that toolkit #4 came at or just before the introduction of the 356-B T-6. Notice that the four wrenches are a different type. The wheel nut wrench and the jack handle have been combined into one tool, and a hubcap puller has been added. Also, there is no tire pressure gauge, and only two wood screwdrivers. Toolkit #5 is clearly the 356-C toolkit. It first appears in the September 1963 owners manual which time is coincident with the start of production of the 356-C's. The toolkit is quite different from its immediate predecessor in that the toolbag clips together rather than being tied together with a strap. In addition, the pliers and generator nut wrench are bright plated rather than black, and a tire gauge is once again part of the toolkit. Lastly, the wood handled screwdrivers are replaced with two red plastic handled screwdrivers. Below are three different Porsche Carrera Toolkits: (1) 356-A Carrera 1500 GS, (2) 356-A Carrera 1600 GS, and (3) the 356-B Carrera 1600 GS/GT. Carrera Toolkit #1 comes from the Owner's Mannual Supplement for the 356-A Carrera 1500 GS (Coupes, Convertible & Speedster), undated. 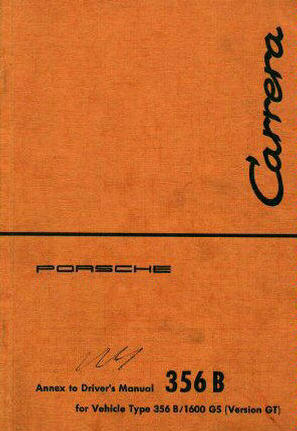 Carrera Toolkit #2 comes from the Owner's Manual Supplement for the 356-A Carrera 1600 GS, Edition November 1958, 12.58.Gl. The only difference between Toolkit #1 and Toolkit #2 is the addition of a third screwdriver in Toolkit #2. 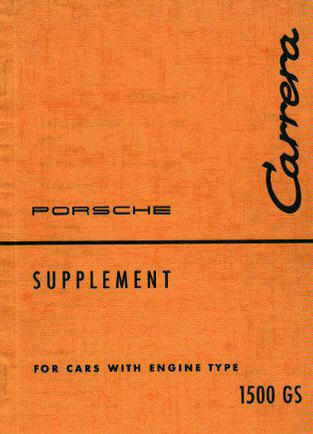 Carrera Toolkit #3 comes from the Owner's Mannual Supplement for the 356-B Carrera 1600 GS/GT, Edition April 1960, 7.60.Gl. 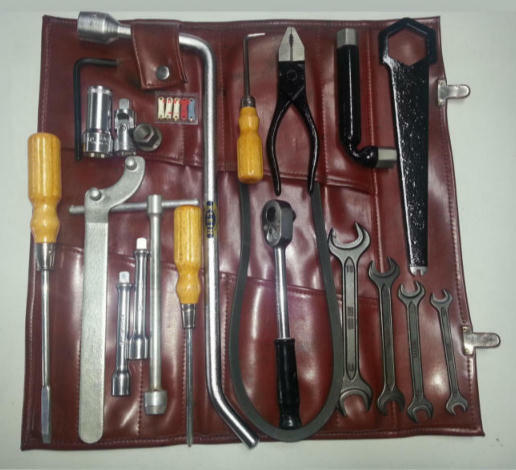 Toolkit from a 1963 356 Porsche Carrera 2 owned by Peter Bartelli. More to come, check back...................!